Infection Prevention and Control in improving patient safety in the healthcare setting will be the focus of activities to observe Infection Control Week. Mrs. Ravariere-Seaman stressed that every healthcare worker plays a vital part in helping to minimise the risk of occurrence and transmission of infections by ensuring that their hands are properly washed and that the clinical environment is as clean as possible. The Health Manager is urging persons to clean their hands before and after preparing food, before eating, and before and after using the restroom. She said drying hands is just as important to avoid the transfer of organisms from wet surfaces. Infection Control Week will be observed from September 9 to 15 under the theme “Save Lives: Clean your Hands”. 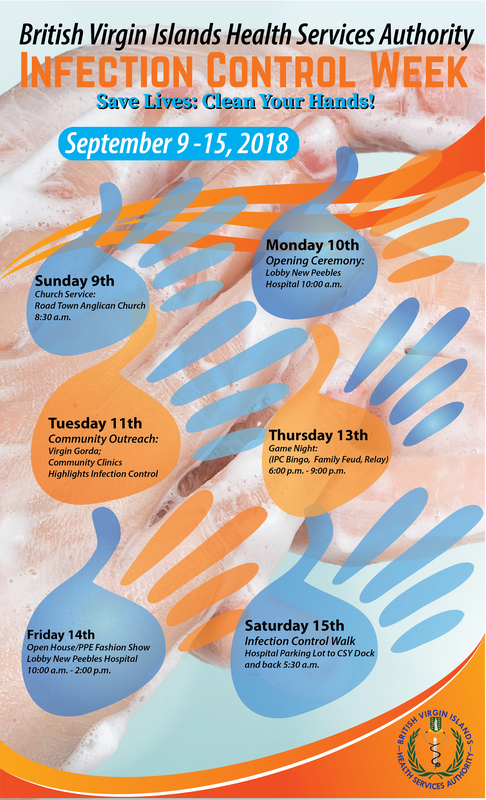 Sunday September 9, a Church Service at the Road Town Anglican Church at 8:30 a.m.
Monday September 10, an Opening Ceremony at the New Peebles Hospital Lobby at 10:00 a.m.
Tuesday September 11, Community Health Centres will highlight various aspects of Infection Prevention and Control. Thursday September 13, vaccines will be available free of charge for staff, and a Game Night to include Infection Control Bingo, Family Feud, and Relay. Friday September 14, an Open House from 10:00 a.m. to 2:00 p.m. in the Lobby of the New Peebles Hospital. The week of activities culminates on Saturday, September 15 with a walk from Peebles Hospital Parking Lot to CSY Dock and back, beginning at 5:30 a.m.